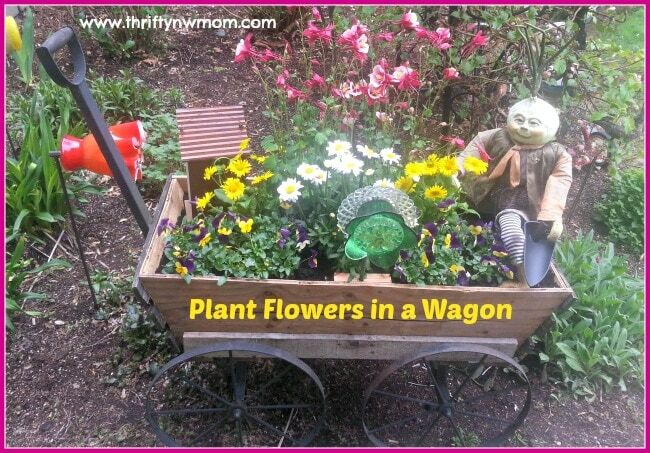 Planting Flowers in a Wagon! 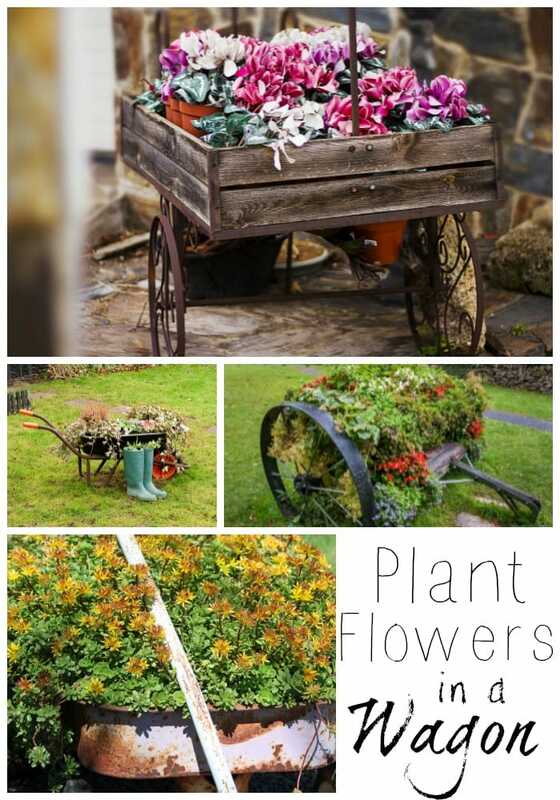 Wagons can be such a fun and inexpensive way to display flowers in your garden. They are also a creative option if you don’t have much yard space, and want to do some container gardening. Keep your eyes peeled at garage sales and yard sales, for inexpensive wagons, and then go to town planting your favorite flowers and plants in them. You can really use any kind of wagon, from the old to the new, and end up with a beautiful display. The idea here is that you can make a fun planter for your garden, that will really stand out from many items. I have seen these done with the radio flyer wagons, old sinks, chairs and even bathtubs and bed frames as garden art. As a matter of fact we have an old bathtub we put in the ground in our backyard that we use to plant strawberries in. The kids love it! Be sure to make sure there are some holes for drainage in the bottom of your wagon. I also like to put a layer of rocks or pebbles on the bottom before filling with dirt, to make sure it drains well when watered. Get the kids involved! 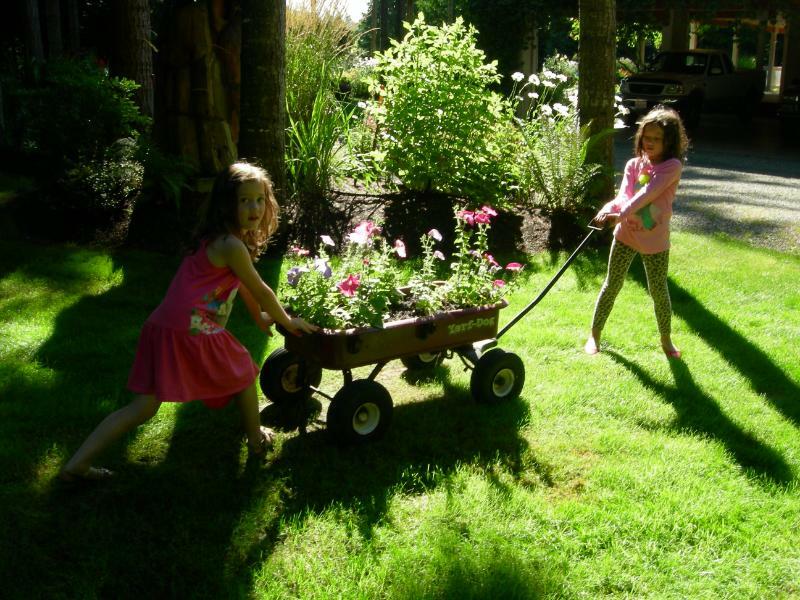 Here we used a working red wagon, with some inexpensive flowers the kids were able to plant. Because this wagon still works and is sturdy, we can move it from spot to spot as we want to change the garden up. 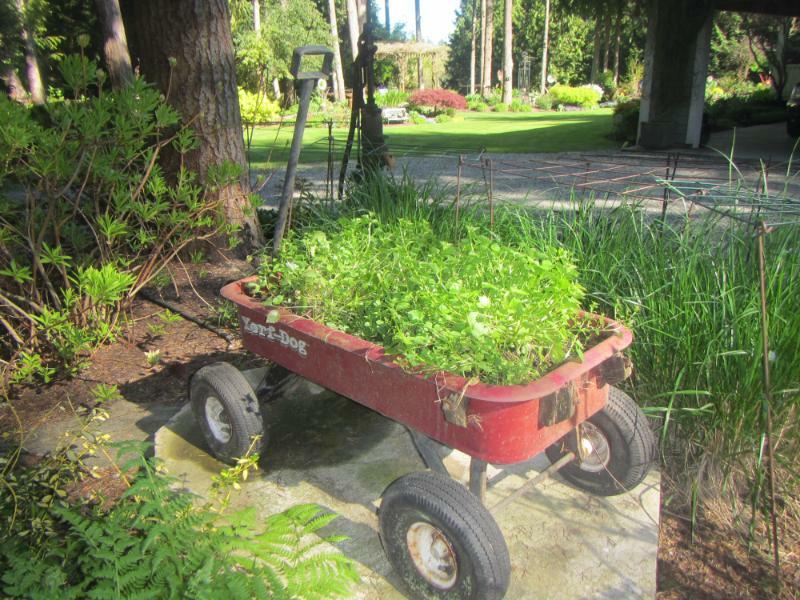 Here is another example of the same red wagon, with some simple ground cover in it. That is one fo the fun things about these rustic containers. You can really fill them with just about anything and they are a show piece. No need to spend big money on expensive flowers to get a statement out of it! 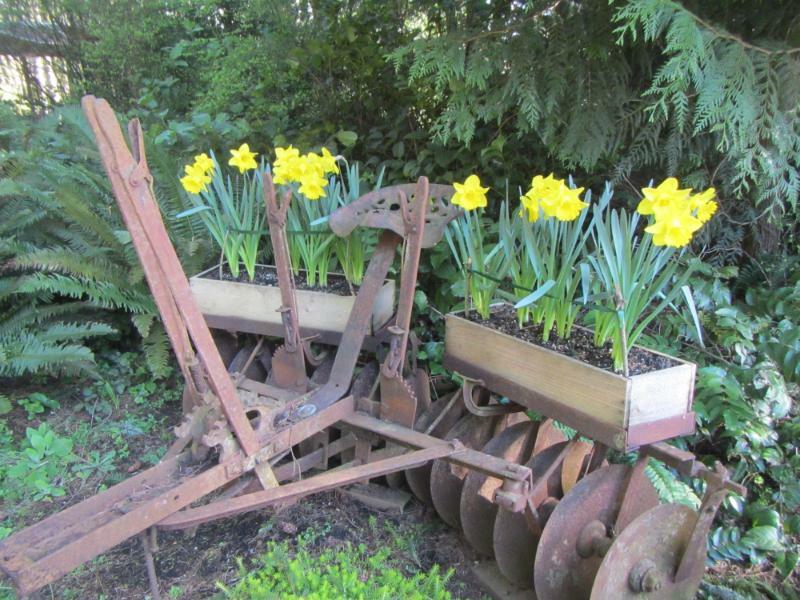 We have even gone as far as using old machinery for planters. We simply added in some planter boxes where we could make them fit, and love the contrast between the hard metal and soft flowers. For something smaller think about using old watering cans, or coffee cans as planters for smaller plants. You can even use washed out tin cans (from your soup or canned vegetables) to plant herbs for your use this summer. As garage selling season starts, its a great time to look for fun items you can add a flower or plant to, that will cost much less then traditional planters, and add more fun to your garden! Here is a fun little planter box that we made for a recent auction at my kids school (pictured below). We had an old wagon that we reinforced and filled with dirt and some flowers. We then added a few pieces of garden art (an onion head guy, glass flower and bird house).